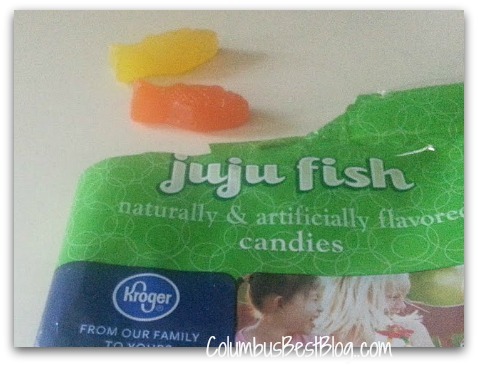 We are in fish on Friday time for some people in Columbus, Lent. Catholics abstain from eating meat on Fridays during Lent, every year. Although I grew up Catholic I did not grow up in a family that ate fried fish. We ate baked fish or tuna casserole in the privacy of our own home some Fridays. Fish was in the minority as I remember it. We ate pancakes. I did not like pancakes as a kid. I loved fried fish when I discovered it in college. Or maybe it was the french fries and ‘macaroni & cheese’ served at “fish fries” with the fried fish. From my college days on while I still lived in Wisconsin, the Friday night fish fries at restaurants were huge. 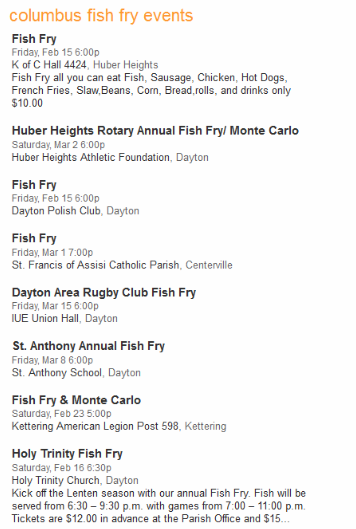 I heard of fish fries at churches but I never went to one until I lived in Columbus. Not that I don’t love the Columbus Fish Market…. num. “Friday Fish Fries” (even if you don’t eat fried fish) are a different experience from eating at a fine restaurant that serves fish. I have only been to one Columbus Catholic parishes “Friday Fish Fry”, St. Joan of Arc several years ago. I think we went because they served baked fish as well as fried fish. We went with a bunch of friends. I have always heard that the best “fish fries” in Columbus is at St. Margaret of Cortona on Hague Ave or Our Lady of Victory in Marble Cliff. An old post online from the Columbus Dispatch asking the question of where the best fish fry in Columbus someone says ” St. Stephen the Martyr, 4131 Clime Road in Columbus, definitely the best.” Columbus westside and south-western suburban Franklin County has better fish than the north-side? Or elsewhere? I have also heard good things about the fish fry at the Shamrock Club in Columbus. * Darn! Although I was searching for “Fish Fry” and “Columbus” the St. Michael the Archangel parish Friday Fish Fry with that menu is NOT in Columbus. The Knights of Columbus, a fraternal organization in many Catholic churches sponsor the “Friday Fish Fry.” That makes Columbus relatively useless as a search term. This St. Michael the Archangel parish is elsewhere. Forget smoked salmon…. A lot of Catholic parishes have pasta or pizza without meat on their menus today because a lot of people do not like fish, fried or otherwise. 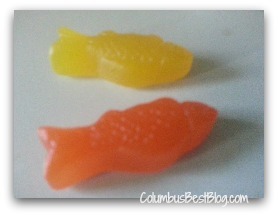 If you want to recommend a fish fry closer to home to friends in central Ohio, use ’365 Things to do in Columbus Ohio’ on Facebook (link in the sidebar on ColumbusBestBlog.com) Pictured some of my favorite fish. Actually the red ones are my favorite. None were available for photography. I was on St. Michael’s Catholic Church of Worthington’s SCHOOL site and saw on the calendar events that it does indeed have a fish fry every Friday from 5-8pm, however, it does not give specifics of what it includes, pricing and if it is Old Bag of Nails. I do know that I have had friends go there before and they said it was the best. I was interested in going myself so I had tried to look up the info myself. Thanks Shantell, I never thought to look at the school site! been serving the best fish dinner in the Columbus area. For 16 years we have strived to provide a great meal at a very reasonable price, while using the best products availablei n the marketplace. On a typical night we will serve between 800-900 fish dinners. and has continued to become more popular by the year. take your meal with you one of these Fridays. I am sure will will be pleased. Once again, thank you for mentioning our event! Michael, Thanks for all the info. I saw the comment via email but could not find it because I assumed it was ON yesterday’s post with a picture of St. Michael’s…. Your St. Michael Fish Fry has fans. A site called ‘The Lutheran’s Guide to Catholic Fish Fries posted their “favorite” this week and it turned out to be St. Michael’s fish fry. They had a post from a previous Lent (they’ve been visiting fish fries during Lent since 2010) when they did the St. Michael Fish Fry drive through because of crazy family / work schedules.